Visualization of cellular hydrogen sulfide by a Washington Red based fluorescent sensor. Fluorescent bioimaging is the visualization of cells and other biological tissues marked with a dye that glows when activated by light. It is used to observe disease biomarkers and other biological compounds in real time and helps doctors identify and treat blood clots, heart disease, tumors and other dangerous abnormalities. Most commercially available dyes for bioimaging fluoresce in the visible spectrum with wavelengths between 400-600 nanometers. There are several practical issues with these dyes. For one, molecules in amino acids, hemoglobin and other natural tissues and fluids also fluoresce when illuminated with colors of light in this region of the spectrum, such as green and blue. This natural luminescence makes it hard to tell the difference between what the dye is targeting and surrounding tissues. 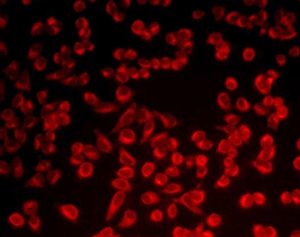 Shorter wavelength light can even damage cells, making dyes of these colors risky to use in live tissues. 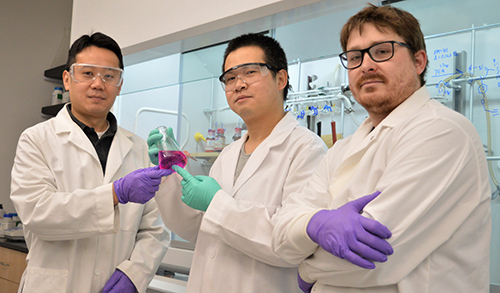 WSU study authors Ming Xian, professor of chemistry; Wei Chen, assistant research professor of chemistry; and Jacob Day, chemistry Ph.D. student (l-r). Near-infrared light, or light with a wavelength between 650-900 nanometers, is ideal for bioimaging because it penetrates deep into tissues without damaging natural cells or causing them to fluoresce. Dyes that show near-infrared light have proven extremely hard to make, however, and tend to be limited in application. Xian’s new Washington Red dye differs from these in several ways. The fabrication process is simpler, and the dye is easy to quench, meaning that it is not going to shine near infrared until it has located and bonded to its target. Washington Red is also highly tunable. It can be modified to seek out and bond to a wide variety of molecules, gases and other substances in the body. Xian worked with the WSU Office of Commercialization to file a patent for his Washington Red dye so it can be used by researchers at other institutions across the country and world. Xian’s research is in keeping with WSU’s Grand Challenges, a suite of research initiatives aimed at large societal issues. It is particularly relevant to the challenge of sustaining health and addressing the onset and progression of disease.